I was quite impressed when I first laid my hands on the new 2018 HP Spectre x360. It has everything (at least on paper) you might expect from a premium thin and light convertible. On top of that, the rather unorthodox design sets it apart from its competitors. Not everyone at Digit has the same opinion about looks, but at least, no one can say that this is another “Apple MacBook Air” copy either. 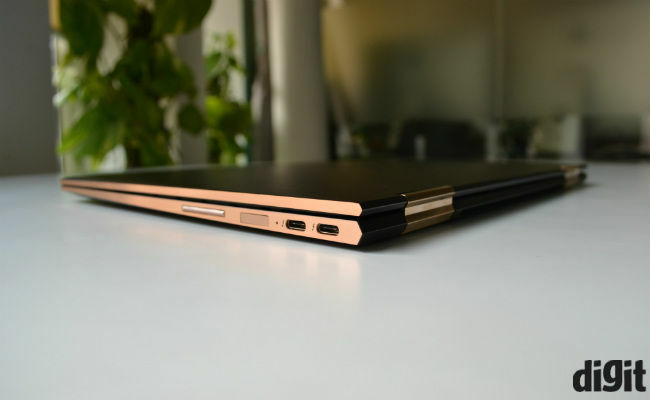 The Spectre lineup from HP, after it was reincarnated in this gold (now copper) and matte black avatar back in 2016 has seen a lot of changes in its annual reincarnations. Over the years, HP has refined the design both externally and internally to a level where it seems almost perfect. The last two iterations had slight heating issues, but this year, HP has found a way to mitigate that problem too. Hence, this new version should be good in every which way, but is it? Back in the day, when the Spectre was initially launched, HP was experimenting with a glass lid cover and featured a physical volume knob on the side. I would be lying if I said, I didn’t like the physical volume knob, but times have changed. 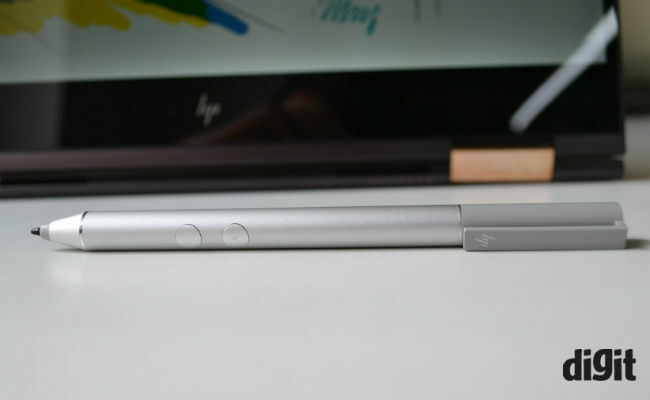 The volume knob may have been lost to time, but the HP Spectre still looks peculiar (different) in comparison to its modern-day counterparts. Among the various homogenous looking machines, the copper and matte black-ish (Dark Ash Silver) look of the Spectre is unlike any laptop you may find in the market. This colour combination though ‘blingy,’ combined with the feel and build quality of the device can only be described as “premium”. Your opinion may differ on the only colour option available in India, but there is no denying the fact that this is as premium a laptop as you can buy today. Looks aside, the all-aluminium shell is quite robust and does not have any torrential flexing in the body itself. The display does have a small flex under stress, but not something a laptop might encounter in day-to-day hustle. The exterior of the laptop hasn’t changed dramatically over the 2017 model, but there are some subtle visible changes. The rear edges, for example, are now hard angled unlike the rounded design of the earlier model. The edges around the top of the display are now slightly more squarish and the four rubber feet have been reduced to two rubber feet which run across the base of the machine. All-in-all, the HP Spectre x360 2018 looks just as detailed as the one it replaces. 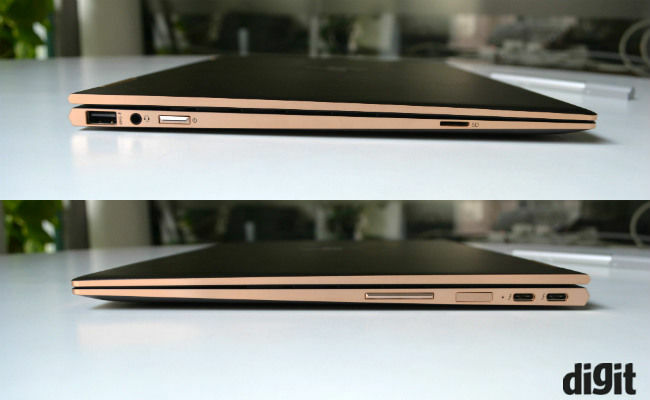 It is minute details like the angled rear which visually hides the rear vents, and we all hate seeing ugly vents on laptops. Hence, it keeps the elegance, thanks to intelligent engineering and design. 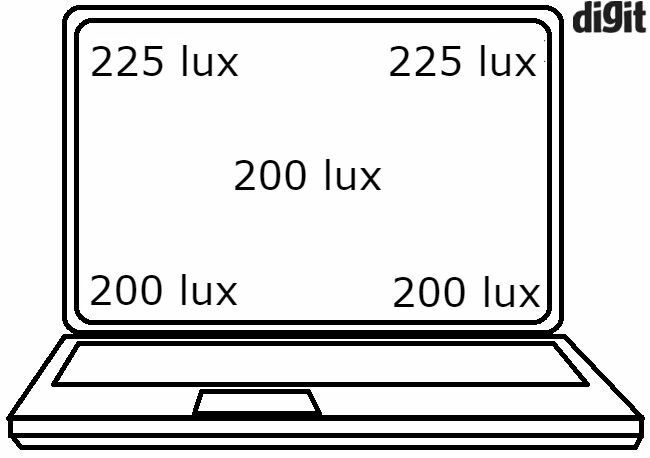 Opening the laptop, you have a vibrant 1920 x 1080p touchscreen display at your disposal. The colour fidelity is quite accurate right out of the box, and the viewing angles are also quite good. A very handy feature which the Spectre borrows from HP’s Elitebook range is the HP Sure View technology which allows the users to hide the display content from prying eyes with the push of a button. It basically makes the display look washed out to anyone who is not sitting right in front of the laptop. All that said, the display does have some shortcomings. First and foremost is the brightness of the display, which I feel is good, but could have been better. Then there is the Gorilla Glass touchscreen itself, which does provide scratch resistance but is quite reflective. Not just that, like most touchscreen displays, it is a fingerprint magnet. As for the touchscreen itself, it is pretty accurate for taking notes via the bundled pen and equally intuitive while using the finger to tap on something on the display. The good part is that the display hinge is resistive enough that it does not fall back when you touch it in normal laptop mode. In addition, since this is a x360, the screen can be folded all the way back, making this a slightly heavy but powerful tablet, on which one can draw as well. The drawing capabilities of the machine are not as robust as its note-taking abilities, but it is nothing to complain about as this is not a dedicated machine for artists, although, it ideally should have been. In this new 2018 variant, HP has also added a microSD card reader, which I don’t think solves the purpose of not having a dedicated SD card slot, but it is there. Besides that, you have two USB 3.1 Type-C ports with support for Thunderbolt 3 (on both) and a single USB Type-A port (much appreciated). Now, before you lose your head over having to buy dongles, HP takes care of that as well. There are almost all kinds of dongles bundled with this, even a multi-port one and I think, other laptop makers should do the same (Apple, are you listening?). The keyboard and touchpad on this laptop have remained largely the same as last year’s, which is a good thing. 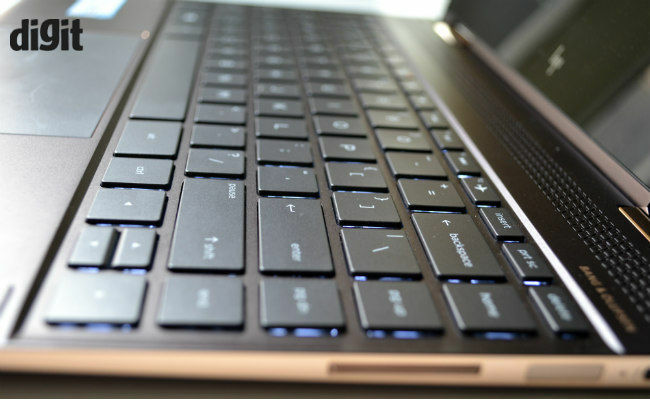 HP has used all that gutter edge space of the keyboard deck and added another row of keys on the right side. This makes the keyboard is a little wider than the usual one you may find on a 13-incher, but once you get used to it, it is excellent to type on. The pitch is right, the keys feel precise and press down with an audible satisfying sound. The keys provide a 1.3mm key travel have a slightly different character to the Lenovo Thinkpad keyboard but are just as good. The only annoying bit is the smaller ‘up’ and ‘down’ arrow keys and the delete key at the far right of the keyboard. In addition to that, I would have preferred a two-stage backlighting on the keyboard. Below that, you have the same oversized touchpad, which has the same dimensions as on the last variant. 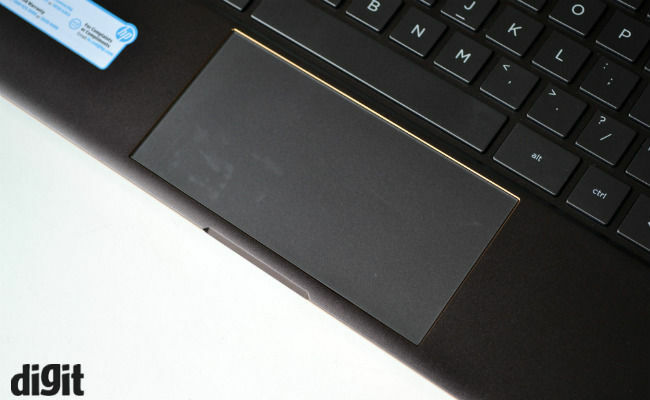 The glass touchpad is precise and provides good control over the cursor while dragging and dropping. The tracking is quite accurate and the Synaptic driver seems to be working just fine. The nondescript touchpad hides two clickable left and right keys, which press down with a soft audible sound and faint tactile feedback. On the security side, HP has added a fingerprint scanner on the right side of the laptop, apart from the Windows Hello enabled camera. 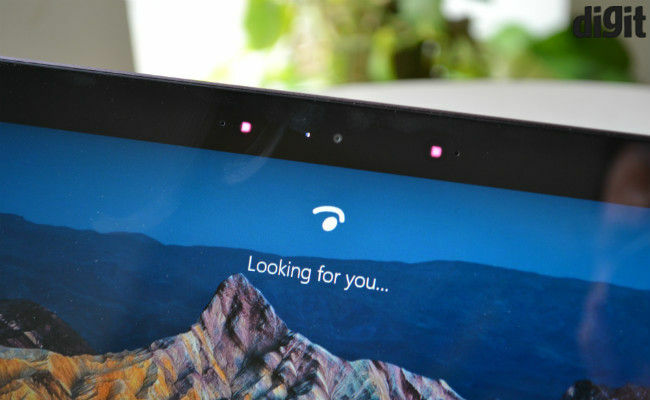 It is a welcome feature since the Windows Hello camera is not that secure or reliable in varied light conditions. The fingerprint scanner on the side is not a swipe type, but a touch type, which is an added bonus and was missing from last year’s x360. 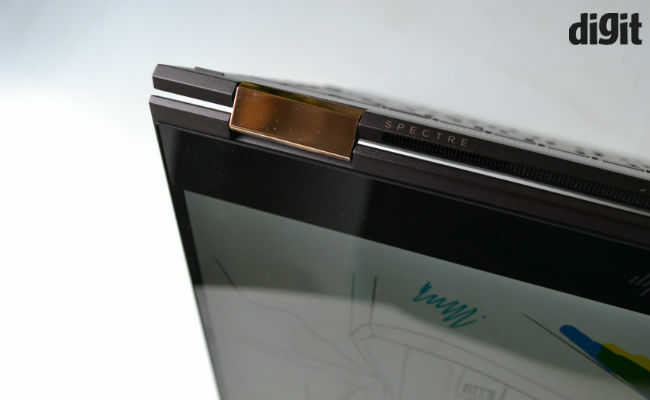 One of the biggest updates to the Spectre x360 this year is the new Intel chip. 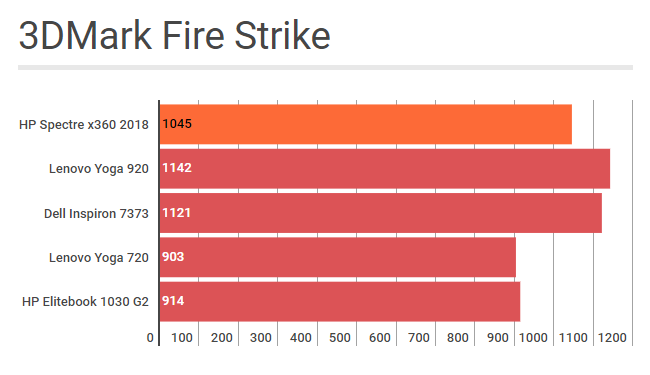 Powered by the Intel Core i7 - 8550U, the Spectre is right up there in the performance benchmarks. The quad-core processor gives a considerable 30 percent performance boost over its predecessor and that's a lot. Combine this with 16GB DDR4 RAM and you have a machine which can easily run more than two dozen chrome tabs, stream music, copy data and run Word all at the same time. There was never a scenario during my testing, where the laptop felt sluggish in any way. However, once I did try to push the machine by stress testing, and the turbo boost dropped down by half a Gigahertz in mere seconds. That said, this has no effect on actual performance. The new integrated UHD 620 also throttles down by about 200MHz under constant load, but that also has no impact on the actual performance. It's not like you can play AAA PC games on this if it didn't throttle. It is a good enough to GPU to support external 4K monitors and even run some less demanding games such as CS:GO at lower resolutions and graphics settings. The best part is that HP has reworked the thermal design of this laptop, which has been a pain point in previous iterations. There are two air vents at the back which do a commendable job at keeping the heat in check. 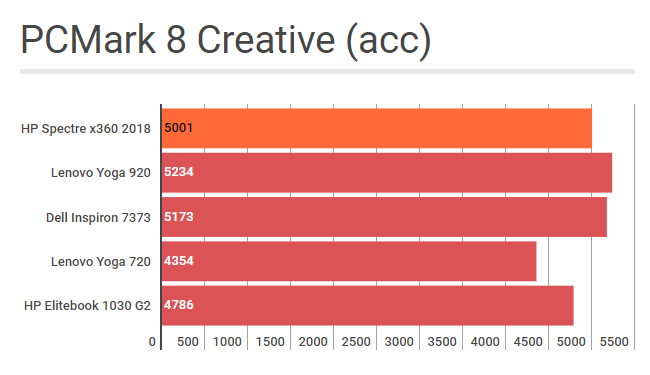 The laptop does get a little warm near the top row of the keyboard during full load but remains relatively cooler in normal day-to-day workload. Also, this new version also runs way quieter than almost all thin and light we have tested thus far. HP completes the package with an admirable battery life of 8-9 hours in normal day-to-day usage. The laptop went on for almost four hours in our PCMark 8 battery test, which puts at par with most thin and light machines these days. The 60Whr battery is quite good and takes the laptop from morning to evening in an office environment without any issues and that would be enough for most potential customers out there. However, if you are looking for extra battery life, the less powerful Intel Core i5 variant might offer a slightly better numbers. All things said and done, the HP Spectre x360 2018 is the new best thin and light 13-inch convertible available today in the market. It has everything you may need from a premium machine like this. It is a powerful performer, offers good battery life, the typing experience is excellent and it looks the part as well. It is just good from any angle you may look at it. I would have loved it more if the display wasn't so reflective, but that seems to be an ongoing issue with all touchscreen laptops I have reviewed thus far. The price is certainly on the higher side, but then none of its competitors offer the same level of craftsmanship, hardware and accessories bundled in the box. 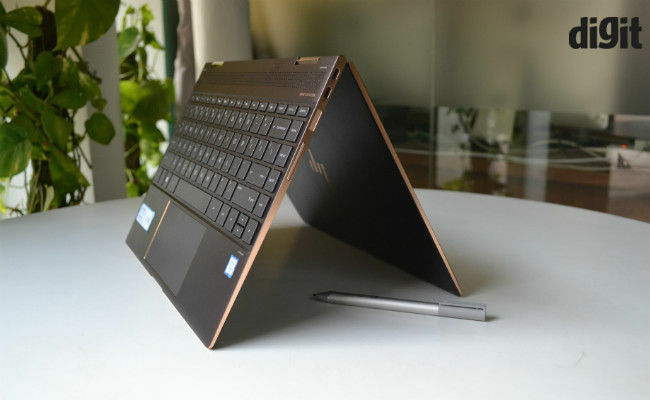 Hence, if you are looking for the best thin and light convertible, you can't wrong with the HP Spectre x360 2018.